After languishing in the aftermath of the global credit crisis, private equity activity is once again on the rise. As of October, buyout firms had made $173 billion worth of deals this year, a level representing a bump of about 95 percent over last year, according to Thomson Reuters. And, with debt cheap and private equity firms flush with cash, deal-making momentum should continue to build—as will the need for seasoned leaders able to steer portfolio companies to growth. But while the corporate world teems with would-be portfolio company CEOs, finding one who can engage employees, make operational improvements and ultimately deliver value is no easy feat, agreed private equity CEOs gathered for a Chief Executive roundtable discussion held in partnership with Fifth Street Finance and Rutan & Tucker, LLP. At a struggling company, the right CEO can make all the difference, asserts Len Tannenbaum, CEO of Fifth Street, who points to one of his portfolio companies, California- based Traffic Control and Safety, as an example. Near collapse when Fifth Street brought in a new CEO six months ago, the company is now stabilizing under his watch. “That crisis is evidence of the difference the right management team can make,” says Tannenbaum. At the same time, even the most diligent of private equity companies can go through a lengthy vetting process to identify a financially savvy leader with a fantastic track record, a seemingly perfect skill set and relevant industry background, only to have him crash and burn. Just ask Michael Bruno, managing partner of Stonebridge Partners. “We’ve had some CEOs with the greatest resumes you’ve ever seen who failed miserably,” he reports. Why the disconnect? In brief, the challenges and opportunities inherent in running a portfolio company, and the high cost of failure, make identifying and attracting an appropriate leader particularly tricky. Sometimes the issue is all too clear—at least in hindsight. For example, a leader who thrived in a large public company environment often struggles to replicate that success in a more entrepreneurial company with limited resources and less structure. As important as it is to choose the right CEO, providing the tools and support essential to success is just as vital. Roundtable participants identified five steps toward paving the way for a new CEO’s success. Calvert Street Capital Partners uses a similar process to vet not only CEOs, but every professional in the firm. “It reveals any red flags in a person’s personality, but it also helps identify potential issues, such as a flaw in a person’s ability to communicate, that we need to know about one another in order to be good partners,” explains Joshua Hall, a senior partner at the firm. Beyond helping a private equity firm choose a CEO, the process can highlight areas where that individual might need support. David Belluck is general partner atRiverside Partners, a private equity firmin Boston that specializes in investmentsin middle-market technology andhealthcare firms. Andrew Brickman is a partner at BairdCapital Partners, a Chicago-based lowermiddle-market private equity businessspecializing in business services, healthcareand manufactured products. Michael Bruno is managing partnerof Stonebridge Partners, a privateequity firm that focuses on nichemanufacturing firms. Wayne Cooper is founder and managingdirector of Greenwich, Conn.-basedGreenhaven Partners and chairman ofThe Chief Executive Group. 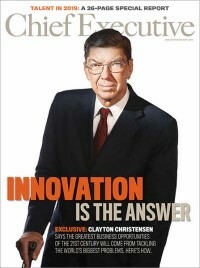 J.P. Donlon is editor-in-chief of ChiefExecutive magazine. Derek Dundas is a partner at Rutan& Tucker, a law firm headquartered inOrange County, California. Greg Grosch is co-founder of White CapIndustries and CEO of Traffic Control andSafety, one of Marwitt Capital’s portfoliocompanies. Joshua M.D. Hall is a senior partnerand cofounder of Calvert Street CapitalPartners, a lower middle-market privateequity business in Baltimore. Ryan J. Kerrigan is a managing directorat the San Francisco private equityfirm Serent Capital, which focuses onservices businesses in growth sectors. Sam Levine is a managing director andco-head of the private investment arm of Eos Partners in New York, which typicallyinvests in businesses undergoing ownershiptransitions. Richard Latto is a managing director atthe Stamford, Conn.-based private equityfirm Longroad Asset Management, whichseeks controlling stakes in middlemarketcompanies. William F. Meehan is a partner at Rutan& Tucker. Daniel Stein is president & CEO ofDimensional Associates, a company withinvestments in small and middle-marketdigital media companies. William Sweedler is cofounder andpartner of Tengram Capital Partners,a Rye, N.Y.-based private equity firmspecializing in consumer and retailsector investments. Leonard M. Tannenbaum is CEO of FifthStreet Finance, a business developmentcompany in White Plains, N.Y., thatinvests in small to mid-size companies inconjunction with private equity sponsors. Jim Velgot is executive director ofmarketing and brand management atFifth Street Finance. W. Scott Warren is a managing partnerat Pennsylvania-based MilestonePartners, a lower middle-marketprivate equity business.